If you prefer to to show the the booking calendar with the availability and rates grid as the first view, you can easily do so. 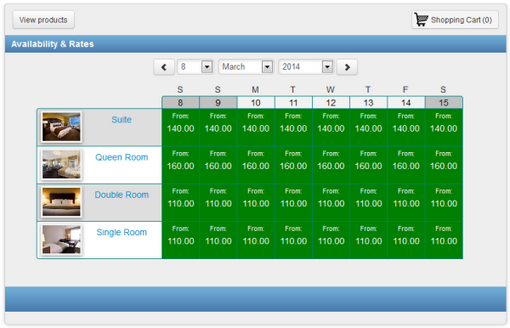 You will need to modify the booking calendar code to include the parameters avgrid and page. You will need to add the parameter in two places within the code, as shown in the example below. Once you've edited the code to add these parameters, then you can embed the code on your website where you want your customer to book. This first view will show your guests at a week's glance all your availabilities. Customer can select a date from the grid, and follow the steps to book. See view below.